Researchers monitoring San Francisco Bay for algal toxins have found a surprising array of different toxins in the water and in mussels collected from the bay. Four different classes of toxins, including one produced in freshwater environments, occur regularly throughout the bay, according to a study led by UC Santa Cruz researchers and published March 10 in Harmful Algae. "The bay is acting as a big mixing bowl where toxins from both fresh and marine water are found together," said senior author Raphael Kudela, the Lynn Professor of Ocean Health at UC Santa Cruz. "A big concern is that we don't know what happens if someone is exposed to multiple toxins at the same time." Although shellfish on the open coast are routinely monitored for some of these toxins, the toxins and contamination levels in shellfish from San Francisco Bay may be very different from what's found on the open coast, he said. The researchers found that 99 percent of mussels collected from the bay were contaminated with at least one algal toxin, and 37 percent contained four distinct kinds of toxins. The contamination greatly exceeded regulatory guidelines for multiple toxins in 2012, 2014, and 2015. Eating contaminated mussels can have serious health effects for humans and wildlife. Although there are no commercial shellfish operations in San Francisco Bay, some people do harvest mussels from the bay for their own consumption. "At first we thought no one eats shellfish out of San Francisco Bay, but in fact you can go online and find blogs talking about the best places to collect mussels, and some of those are the places where we found the highest toxin levels," Kudela said. "I don't know how widespread it is, but I wouldn't recommend harvesting shellfish from the bay, even if you're following the state quarantine guidelines, because the state only monitors the open coast." Domoic acid, a neurotoxin that causes amnesic shellfish poisoning in humans, is produced by marine diatoms in the genus Pseudo-nitzschia. Paralytic shellfish toxins (saxitoxins), which cause paralytic shellfish poisoning, are associated with marine dinoflagellates in the genus Alexandrium. Dinophysis shellfish toxins (okadaic acid and derivatives) cause diarrhetic shellfish poisoning and are produced by marine dinoflagellates in the genus Dinophysis. Microcystins, produced by freshwater cyanobacteria in the genus Microcystis, are hepatotoxins that cause liver damage in people and animals. Mussel samples often exceeded recommended guidelines for human consumption for both microcystins and Dinophysis shellfish toxins. Levels of domoic acid and paralytic shellfish toxins were lower than the regulatory limits, but Kudela noted that some studies suggest chronic exposure to even low levels of these toxins may cause neurological impairments. "Also, this was a fairly small study, so there may be bigger peaks than the levels we saw," he said. Kudela, a leading expert on harmful algal blooms, works closely with state and federal agencies, and he said several agencies are considering changes to their monitoring programs in light of these new findings. The evidence of widespread contamination of the bay with microcystins from freshwater sources, for example, has caught the attention of inland water agencies and led to increased efforts to identify the sources. "In these boundary areas like San Francisco Bay, it's not always clear which agency is responsible. We need to look at coastal areas more holistically so we don't end up with a regulatory gray area where nobody's monitoring the shellfish but people are still eating them," Kudela said. He noted that commercially harvested shellfish are generally safe because they undergo regular testing. But neither microcystins nor Dinophysis shellfish toxins have been included in the routine monitoring of California shellfish. 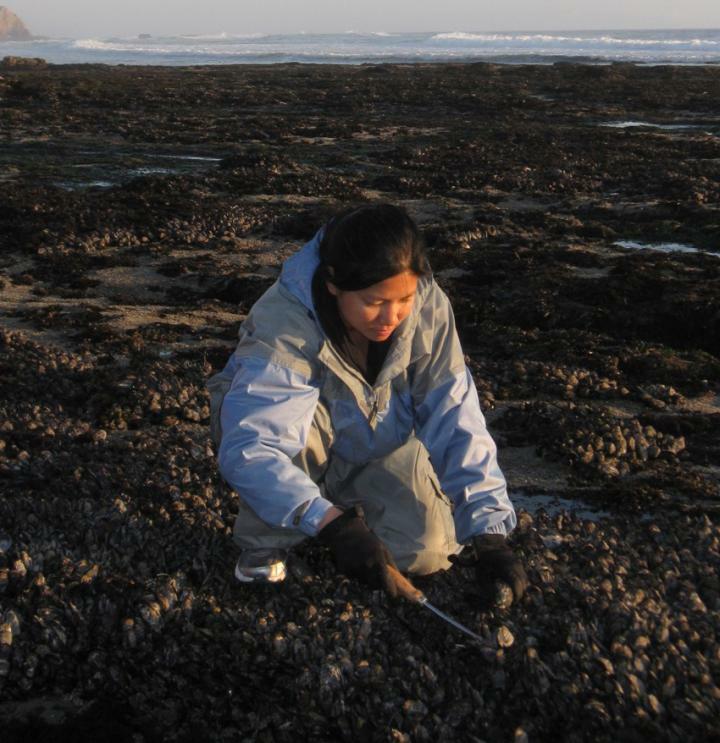 The study began in 2011 when Kudela's lab started monitoring for domoic acid and microcystins in the water during regular water quality surveys conducted in San Francisco Bay by the U.S. Geological Survey (USGS). When those surveys revealed both toxins were occurring throughout the bay, they began testing shellfish and looking for all four toxins. "This is the first time we've found all four of those toxins, including both freshwater and marine toxins, in the same mussel samples," Kudela said. The study coincided with a major drought in California, but how that may have influenced the findings is not clear. "Drought potentially brought some of the marine toxins further into the bay because there was less river flow, and it probably intensified the freshwater toxins," Kudela said. "We don't think the toxins were only there because of the drought, but it could have amplified things." The authors of the study include first author Melissa Peacock, a former graduate student and postdoctoral researcher at UC Santa Cruz who is now at Northwest Indian College in Bellingham, Washington; former UCSC graduate student Corinne Gibble, now at California Department of Fish and Wildlife; SFEI researcher David Senn, lead scientist for the San Francisco Bay Nutrient Management Strategy; and USGS researcher James Cloern. This research was funded by the National Oceanic and Atmospheric Administration (NOAA) and the San Francisco Bay Nutrient Management Strategy, with additional support from USGS.